I am sure that I am not alone in finding Andrew Strauss a thoroughly decent, dependable and impressive man and cricketer and so was much looking forward to reading his autobiography. The attributes of Strauss come through in the book. Concisely written, it is a modest account which appears to be written in a style that is unlikely to offend. Of course, a serialisation of the book before its official launch inevitably picked up on the Pietersen saga of a couple of years ago but, throughout the book, Strauss details points articulately - as you might expect - and methodically. He naturally goes into detail about his impressive entrance into Test cricket where he made a century in his first innings. I was a little surprised not to read anything of the equally outstanding second innings when he might have scored a further century but maybe this says more about Strauss the man. It was Strauss who took England to the top spot in Test cricket and he details how he and Andy Flower went about this, how the players were involved and ultimately the ambition was realised during the 2011 four nil drubbing of India. It is small wonder that, with such talents, Strauss was put forward as a candidate recently to take over as MD for the ECB as Hugh Morris's replacement. 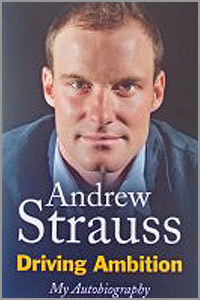 Despite his highly impressive start to his Test career, events did not always continue in such vein but Strauss freely writes about the pressures of being an international sportsman as well as taking over the Middlesex captaincy at a young age and, towards the end of the book, details the events which helped lead to his decision to retire. Having a young family and spending a lot of time away had an understandable effect and all these points are noted. I did wonder briefly about the title of the book, Driving Ambition. Strauss may have been well known for his cut shots but freely admits that driving was not quite his forte so, ambitious as he undoubtedly is, I did wonder whether there was something in the title. His sense of humour does come through when, after his retirement, there was a feeling he would turn to politics, an idea which Strauss writes " Perhaps someone saw my ability to keep talking through a press conference while actually saying nothing of consequence and reckoned that it would transfer well into the world of politics." The statistics by Sky's Benedict Bermange are hugely impressive. Twenty-four pages of them and, whilst we know that Strauss was a highly dependable opening batsman and a person in whom you felt English cricket was in safe hands - still may be off the field - the reader might just detect that he had a weakness in ODIs against slow left arm chinamen making no runs and being dismissed once from his second ball... The statistics go into a lot of detail. During the summer, I went to Cirencester Cricket Club for a charity game arranged by Shane Warne and Elizabeth Hurley. Andrew Strauss was the most popular cricketer there, freely signed books - and I was delighted to acquire his autograph - but, for me, maybe the nicest moment was when a lady thanked him for the memories. Andrew Strauss was that sort of man and cricketer. Applauded out of his retirement announcement press conference, Andrew Strauss did a lot for cricket in general and one hopes that he will continue to do so. Driving Ambition is a very nice book which I am sure will prove to be hugely popular.